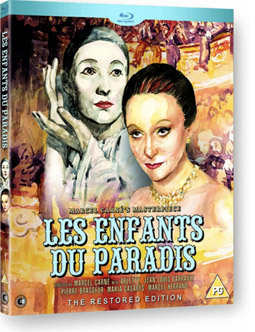 Voted 'The best French film ever made' by the French Film Academy and critically acclaimed the world over, Les Enfants Du Paradis is set amidst the glittering theatre world of 19th century Paris. The story revolves around the beautiful and free-spirited courtesan, Garance and the four men who compete for her affections: a mime-artist, an actor, an aristocrat and a criminal. As the melodrama unfolds we are treated to one of cinema's greatest love stories, a captivating tale of passion, deception and murder. If you've never caught Marcel Carné's 1945 dramatic triumph then you really are in for a treat. It's a film Total Film described thus: "The multi-layered screenplay, stunning sets and a terrific ensemble are just some of the enduring pleasures of a truly collaborative masterpiece." After a major restoration the film screened at the Cannes Film Festival to huge acclaim, Second Sight is to release Les Enfants Du Paradis – The Restored Edition in limited edition packaging on high-definition Blu-ray and as a two-disc DVD set on 17th September 2012 at the RRP of £19.99 for the DVD and £22.99 for the Blu-ray. Restoration – before and after comparison.